Monday, October 23, 2017 ~ 10:30 a.m.
Sunday, October 22, 2017 ~ 6:00 – 8:00 p.m.
Edward “Ed” A. Kucera, 65, of Ashland, NE, died Wednesday, October 18, 2017 at Methodist Hospital in Omaha, NE. He was born October 24, 1951 in Wahoo, NE to Robert H. and Drusilla J. (Dorland) Kucera. 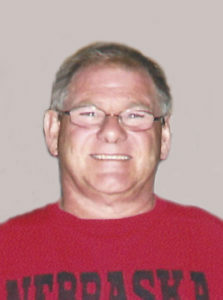 Ed graduated from Ashland High School in 1970 and graduated from Iowa Western Community College. On February 17, 1978, Ed was married to Terri DeFoil at the Methodist Church in Memphis, NE. Ed owned and operated Memphis Paint and Body for many years before working in Omaha. Most recently, he owned and operated Kucera Sales and Service in Ashland. Ed enjoyed working on cars, woodworking, yard work, Husker and Chief football and spending time with his family. He is survived by wife of 39 years, Terri Kucera; children, Kimberly (Norm) Henderson of Mineola, IA, Chad (Melissa) Howard of Omaha, NE, Dave (Melissa) Kucera of Omaha, NE, Abigail (Krayten) Williams of Ashland, NE and James (Laura) Kucera of Omaha, NE; grandchildren, Samantha (Brian) Benedict, Levi and Olivia Henderson, Gerik, Ethan and Jaxen Howard, Haley Brutsche, Josh and Kyle Kucera, Savanna, Noah, Luke and Isabelle Williams, Ike, Walker and Irie Kucera; great-grandchild, Henry Benedict; brothers, William (Julie) Kucera of Gering, NE and Jim (Renee) Kucera of Ashland, NE; brother-in-law and sister-in-law, Ken (Vicki) Aitchison of Chesterton, IN and Mark DeFoil of Omaha, NE; niece and nephews; many other family members and friends. He was preceded in death by parents, Robert and Drusilla Kucera. So sad to hear of this loss. My heart goes out to the entire Kucera family. Prayers and Angel Wings to help comfort and guide you through this heartache. My thoughts and prayers are with all of you during this time of grief and also celebration of the passing of your loved one, Ed. RIP Eddie. I will never forget how patient you all were having your little cousin always tagging along when we visited on summer vacations. My love and prayers to Terri and the rest of your family. You will be greatly missed. So sorry to hear of your loss. Hugs and prayers to the entire family. Always loved going up to the shop with Jim Steffen and hanging out. Ed was so laid back. What a great guy. So sorry for the loss of Ed… he was a great and caring friend for many years.lots of love and hugs 🤗 from us to you and your family. I worked with Ed many years at Quality Lincoln Mercury. He was fun to work with, fun to talk to. I will miss him. RIP my friend. I am so sorry for the loss of a great man, he will be truly missed by many. So sorry to hear this news. Keeping you in our thoughts and prayers. I was very saddened to learn that Ed had died. To Terri and the whole family, you have my sympathy. I’m sorry to hear about your loss,Terri. So Saddened upon Hearing of Ed’S Passing He was a long time Family friend. All my Love, Prayers and condolences to the Family. May God be with you and find comfort in him. Teri and family — was so sorry to hear about Ed. Hold close all the great memories. Please know you are in my thoughts. So sorry to hear about Ed passing. Our prayers are with you and your family.